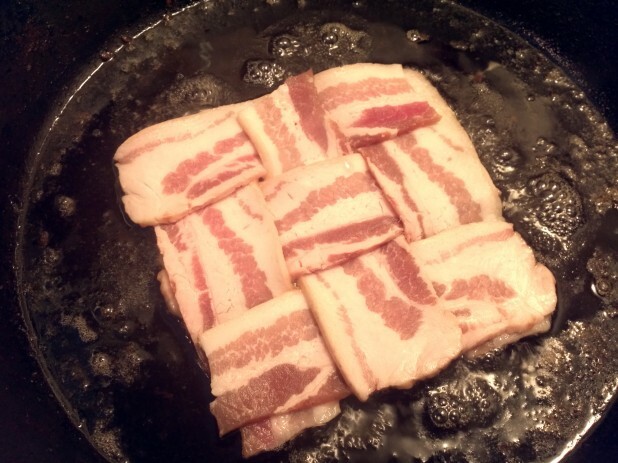 Update: I’ve posted a YouTube Video on how to make a Bacon Weave! On the weekends I like to cook breakfast from scratch. During the week I will often eat something premade that is easy to reheat like breakfast quiche or breakfast muffins. Today I wanted to make an open sandwich with my two favorite things, eggs and bacon! 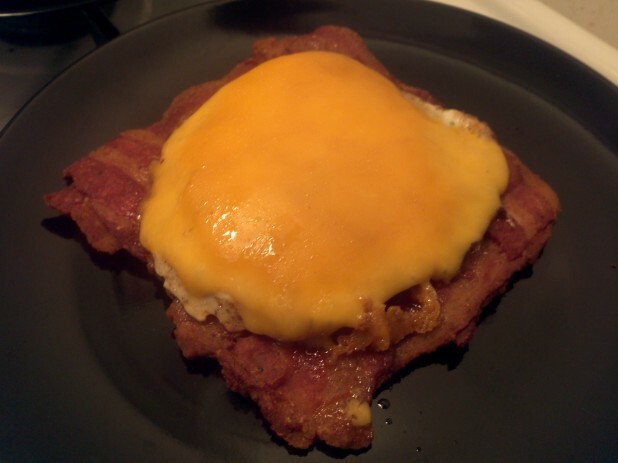 Here is what we ended up with, a bacon weave open sandwich. Let’s see how its made! 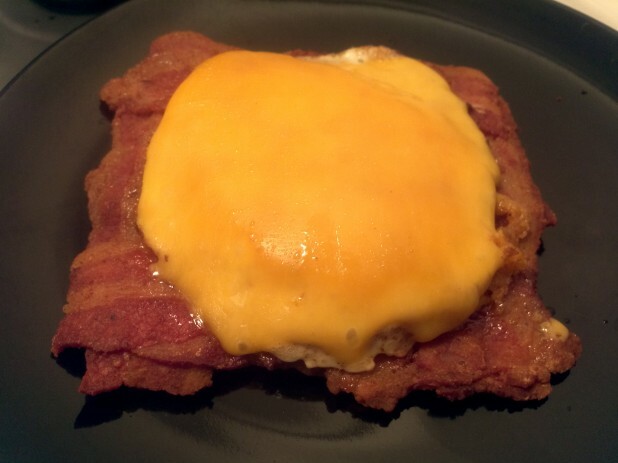 Start by cutting 3 slices of bacon in half. I use thick cut bacon, specifically, Wellsley Farms Thick Cut bacon from BJ’s, if you happen to have one near you. It comes in a two pack and it works well for weaves. Make a mini three by three weave as shown and carefully transfer it to the pan. I use my fish spatula for this purpose. As an aside, I actually got the idea to use a fish spatula from my hero, Ree Drummond, The Pioneer Woman. The key to perfectly flat bacon, especially with a bacon weave like this, is a good, solid bacon press. Cook the bacon until its pretty well done on one side, you need the bacon to essentially glue itself together. Another key here is to cook it low and slow, don’t cook the bacon too fast or it will burn and curl. 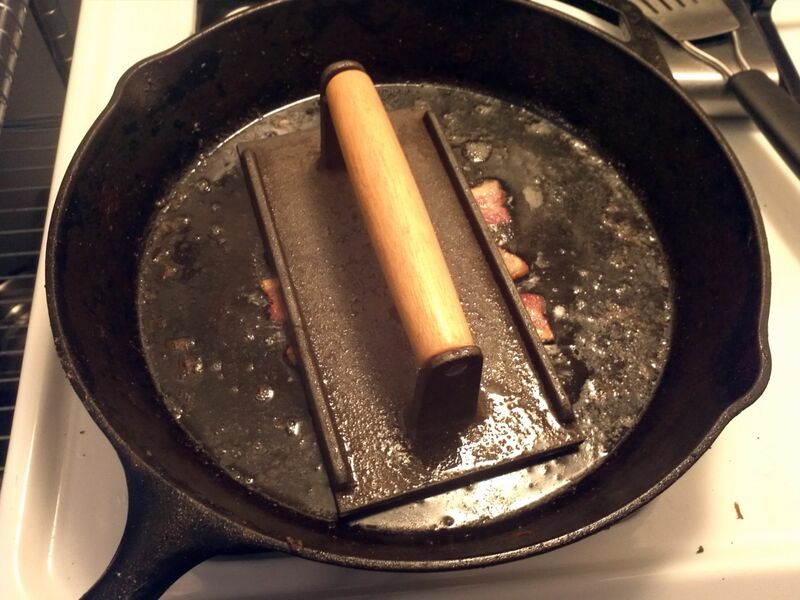 When I’m done with the bacon, I drain most of the grease into my bacon grease keeper. I keep some in the pan to cook the eggs. 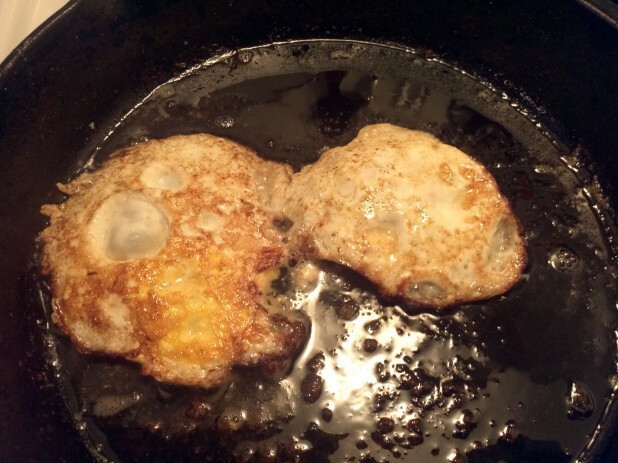 My wife doesn’t like runny eggs but I do so I break hers with the spatula after cracking both eggs into the skillet. Unfortunately my floors aren’t level (damn landlord!) 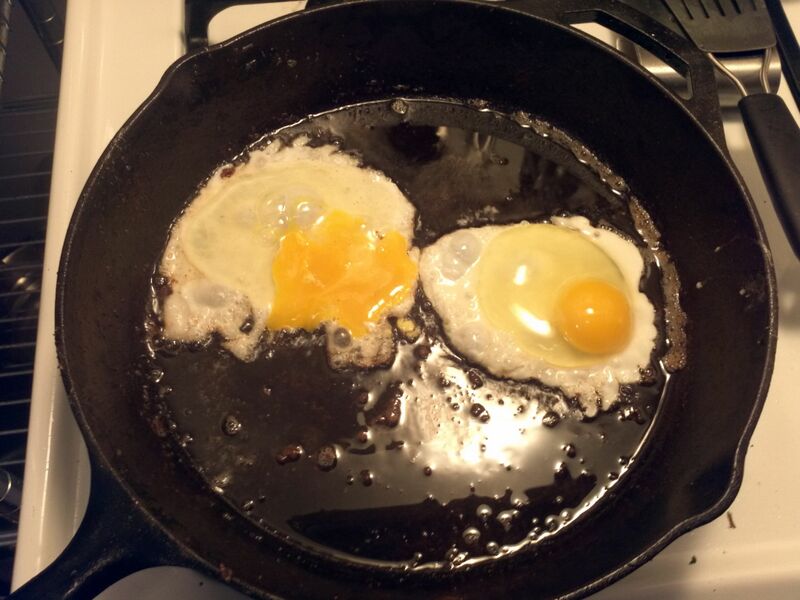 so my yolks always lean towards the right. Oh well. Just starting out, you wouldn’t think that cast iron would be good for eggs. But once your skillet is seasoned properly, its better than any other cookware out there. And its cheap! This one is a standard lodge 12″ that I’ve had for a few years now. Throw some cheese on the eggs. 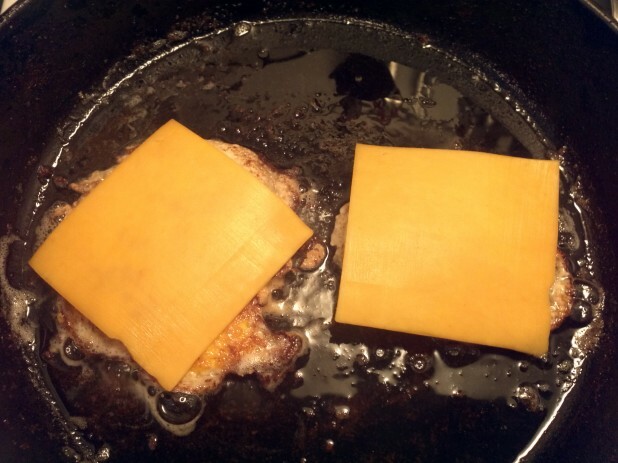 The cheese never seems to melt when put on afterwards, so I make sure to get it started in the pan. I think the cheese I use, sargento cheddar slices, is pretty thick so it needs to melt in the pan a little. Here is the final masterpiece! I ended up just eating it with my hands. It turned out even better than I had hoped. 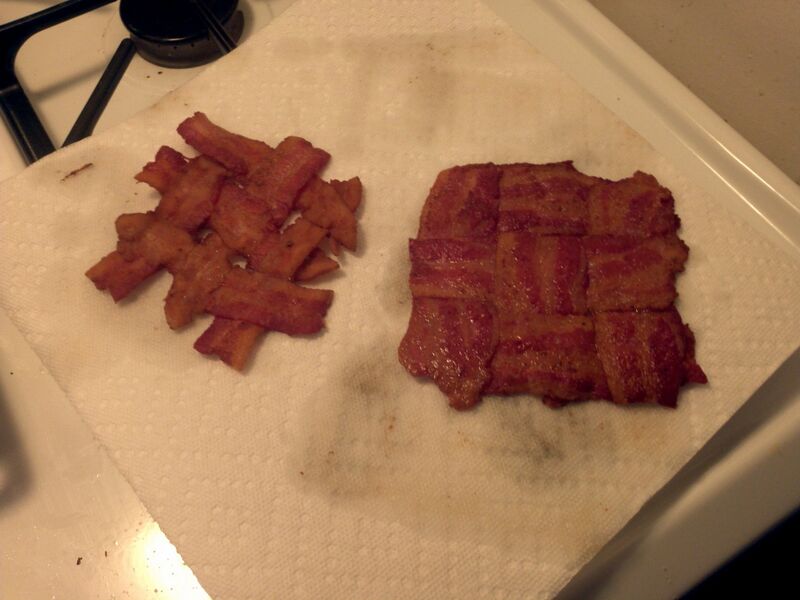 The bacon really fused together and the weave turned out great! 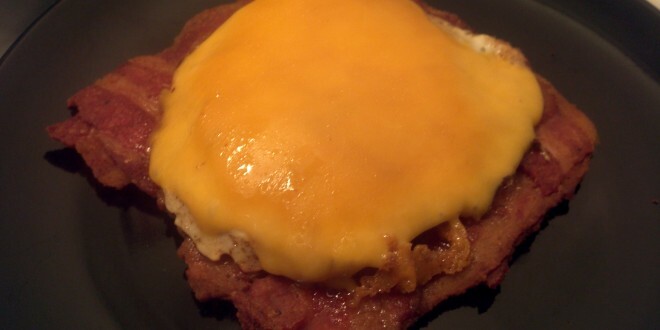 Thanks for your great ideas for Keto-ers, checkin this site daily to see what you come up with. How does this only have 1 carb? Doesn’t sliced cheese have more? It’s not your floors that aren’t level. It’s your stove. There should be little legs underneath that you can use to level things off even if your floors are sloped. I started browsing this site yesterday and one thing that I noticed is that you have a similar format to Ree, whom I’ve used many many many recipes from, lo and behold you love her too! Great stuff you have here, thanks for making this site!